Alonso, L.; Agusti, R.; Sallent, J.
Alonso, L., Agusti, R., Sallent, J. 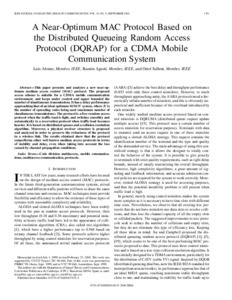 A near-optimum mac protocol based on the distributed queueing random access protocol (dqrap) for a cdma mobile communication system. "IEEE journal on selected areas in communications", Setembre 2000, vol. 18, núm. 9, p. 1701-1718.